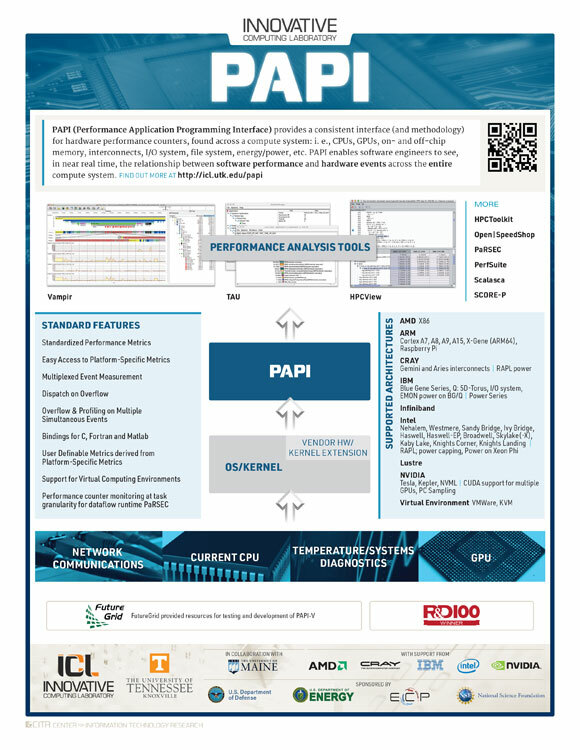 The Performance Application Programming Interface (PAPI) supplies a consistent interface and methodology for collecting performance counter information from various hardware and software components, including most major CPUs, GPUs and accelerators, interconnects, I/O systems, and power interfaces, as well as virtual cloud environments. Industry liaisons with Bull, Cray, Intel, IBM, NVIDIA, and others ensure seamless integration of PAPI with new architectures at or near their release. As the PAPI component architecture becomes more populated, performance tools that interface with PAPI automatically inherit the ability to measure these new data sources. 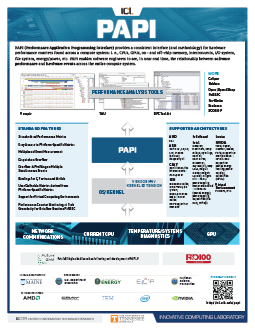 In 2015, ICL, together with the University of Maine, began work on PAPI-EX to build support for performance counters available in recent generations of CPUs and GPUs, develop support for system-wide hardware performance counter monitoring, create a sampling interface in PAPI, and incorporate a user-facing command line tool for PAPI. PAPI-EX will also incorporate a counter inspection toolkit designed to improve understanding of low-level hardware events. At the end of 2016, ICL was awarded funding for the ECP Exa-PAPI project, which will augment PAPI-EX.